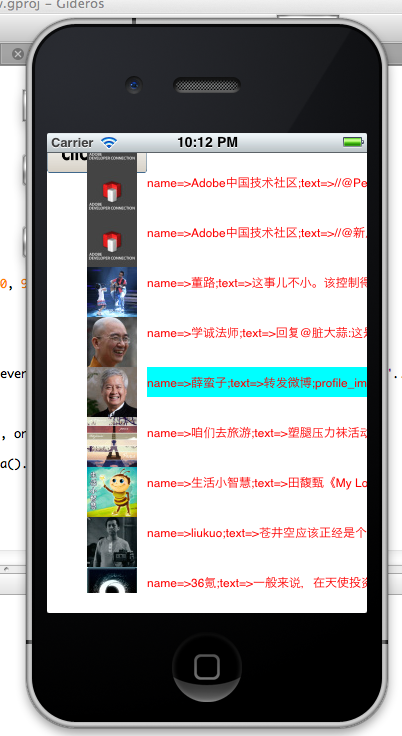 I think I understand the steps which you mentioned, because I can run in Other Plugin in iOS Simulator smoothly. 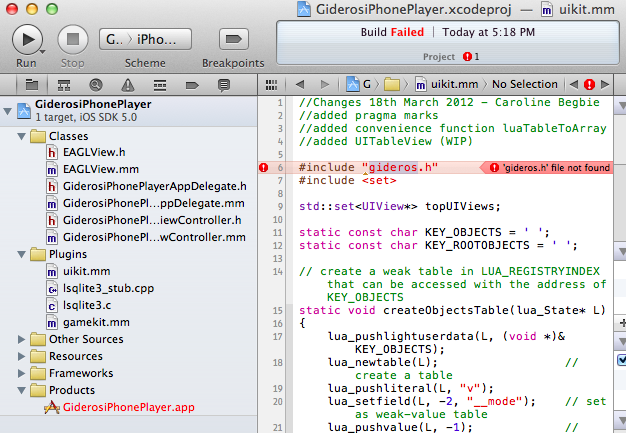 I have added uikit.mm into the GiderosiPhonePlayer project but it gives me a warning of "gideros.h file not found " I have attached the screen shot too. The gideros.h file might not be included in your project. I can't remember if I had to do this. But you can find it in the subfolder somewhere - I think it's in the Plugins folder in the GiderosiPhonePlayer project folder. Just drag it into Xcode. You might have to repeat for all the other ones it complains about. Thanks Caroline, I make it finally and they are the things what I'm looking for and Thank MikeHart for sharing this plugin.
? is that a requirement for some reason? I just realised that on disk I've got my plugins in the Classes folder, while my .h files are in the Plugins folder. In fact my uikit.mm is not even in the same iPhoneGiderosPlayer folder - it's currently located in a completely different folder (I'm not working on it at the moment, so it's not in the working folder). If you already added the header files (as you did), then it's not required. Oh *-:), so it's either add the header files, or put the plugin .mm in the correct place, so you don't have to add the header files . Recently ,I use gideros ,but now I have some trouble with it. MikeHart's UIKit plugin is a first release - in my opinion I don't think that it is ready for a full-on UIKit app. One of the outstanding problems is memory management - that the plugin does not allow hierarchies of views. A simple thing like adding a view to the application's root view is OK, but adding a view to that view becomes difficult. 4. For that reason, you can't currently implement UINavigationController, as that requires a subview hierarchy. 3. Thank you for the fix - I've updated it on github. 2. I don't know what you mean by this. 1. The UIKit plugin only has UITextField implemented. Multi-line is done with UITextView. It shouldn't be too hard to implement UITextView, using UITextField as a pattern. with the scrollview, adding other elements (which are views anyway) works perfect so your statement is not totally correct. About the statusbar! What was changed in between that the bar was always hidden? @MikeHart - it's only when you come to remove the views that it's problematic - adding them is fine. So yes, if the app has static views, then it works great. There was a debugging statement left in there - not sure how that happened. It was possibly me when I was messing around with stuff. Sorry. No need to be sorry for. I was just wandering why there was a problem with the statusbar. It is a long time since I had work with/on that plugin but before the statusbar could be hidden and showing perfectly. I did wrong or what I do less? @louis, I may be missing something, but it seems to me that, in the create() method, you're leaking memory (the Cocoa way): you shouldn't need to "retain" the view, as it was created using an "alloc/init" combination, so the additional retain would prevent it to be dealloc'ed at a later release. You'll also need to send the correct path of the image, which is in the player's Resources folder, and I can't remember for the moment how to access it. I thought it was "|R|filename", but that doesn't seem to be working. About the "retain" issue. I remember thinking the same thing a while ago, because all the UIKit items do it. But I *think* I eventually went "Oh - that's why", but my memory is cloudy. @louis - sorry, don't know the answer to the post method question - you could open a separate topic for it, in case people miss it in here. @louis - You should change the filename in main.lua, not in the plugin. The plugin should just take the string that is given from Lua. @louis - also, to be consistent, I think the names of the classes ought to be ImageView and ImageViewBinder, as there is a UIKit class called UIImage as well as UIImageView. It's a bit of work though, so you might not want to. haaaa,just now ,I got it . @louis - Edited because it's late and I got it wrong again . I think you have it now then? You do need the "|R|filename.png" in main.lua to get the right path for the file.